Try this flavorful VELVEETA Hot N Cheesy Crab Dip. This VELVEETA Hot N Cheesy Crab Dip is the perfect way to kick off your holiday celebration. 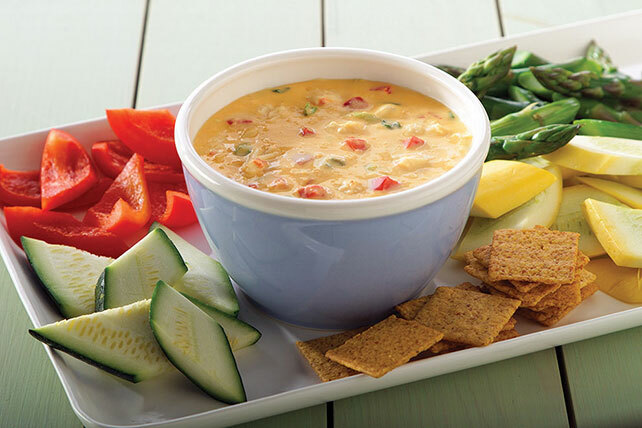 Serve this delicious crab dip with your favorite crackers or chopped veggies like red peppers or cucumbers. Combine first 4 ingredients in large microwaveable bowl. Prepare using 2% Milk VELVEETA, and BREAKSTONE'S Reduced Fat or KNUDSEN Light Sour Cream. Cut ingredients in half; combine in 1-qt. microwaveable bowl. Microwave on HIGH 3 to 4 min. or until VELVEETA is completely melted and mixture is well blended, stirring after 2 min. Makes 12 servings, 2 Tbsp. each. Serve with your favorite crackers and/or assorted cut-up fresh vegetables.